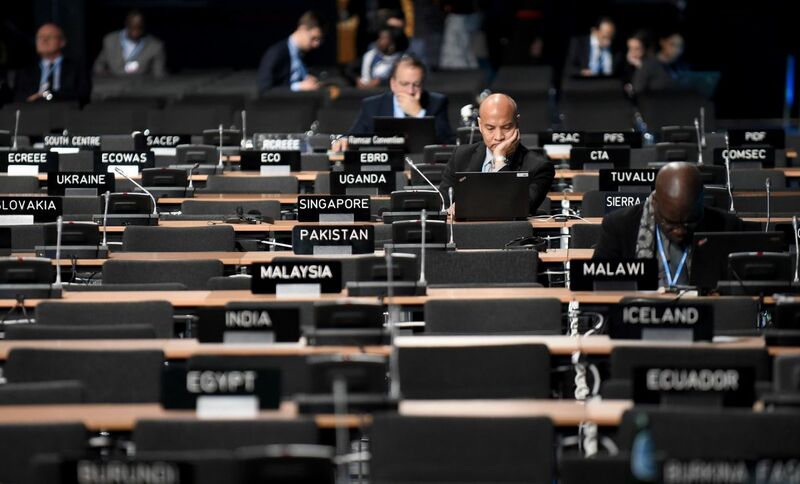 Participants at work in the main plenary room during the COP24 summit in Katowice, Poland, on December 4th, 2018. 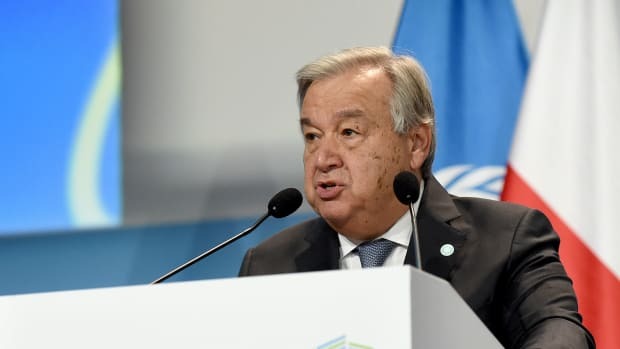 As the big annual United Nations climate conference began this week in Katowice, Poland, the COP presidency has praised the city, a former mining town, as a symbol of a successful "black-to-green" transformation. 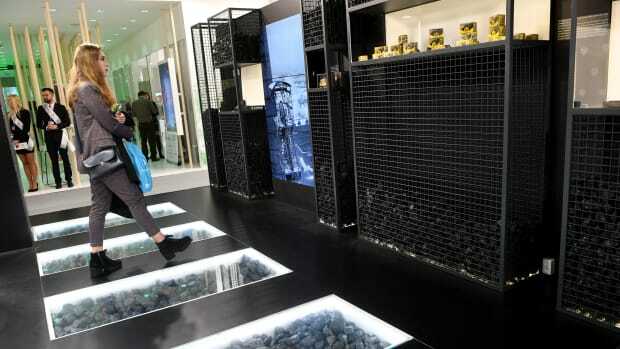 But at the heart of the maze-like COP24 conference center, in the space dedicated to state-sponsored exhibits, it&apos;s hard to ignore the Polish Pavilion stuffed with actual coal, or the nearly ubiquitous logos of the fossil fuel companies that, as Poland announced just last week, are among the COP&apos;s major sponsors. Civil society has been complaining about corporate influence over climate negotiations for at least as long as these summits have been formally taking place. "We have been trying to address this for 25 years," Nathalie Rengifo, of Corporate Accountability, which tracks business influence over policymakers, said in press conference in Katowice on Tuesday morning. But there are still no strict rules limiting the participation of powerful industry corporations or groups—some of which, like the fossil fuel industry, "have more money than countries," Rengifo adds. In a side event Tuesday night, Jean Su of the Center for Biological Diversity noted that many of the major climate agreements produced by the United Nations Framework Convention for Climate Change, including the Paris Agreement, make no mention of fossil fuels. "There&apos;s no mention of coal, no mention of gas, no mention of oil," Su said. "Everyone in this room knows that fossil fuel corporations continue to bankroll these basic climate negotiations and undermine them." It&apos;s not just activists who are worried about corporate capture of the climate talks: Last year several countries, including Ecuador, China, and India have called for rules to rein in the "undue influence" of industry. But this year, the list of COP sponsors still includes Polska Grupa Energetyczna, the largest state-owned Polish power company and the biggest coal-fired power plant developer in the European Union, and JSW, a state-owned producer of coking coal. While it&apos;s highly unusual to find out the corporate sponsors so late in the game, the fact that fossil fuel interests, whether state or private, are among them was no real surprise. 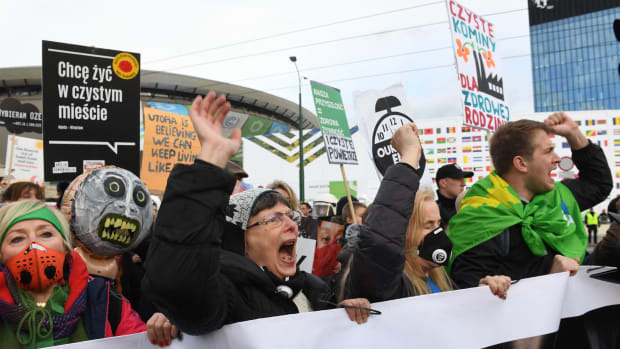 PGE was also a major sponsor of the last round of talks that took place in Poland in 2013, COP19, dubbed the "corporate COP" by watchdog groups for the long list of polluters who helped bankroll the meeting. This arrangement is hardly unique to Poland: In Paris in 2015, the French utilities companies Engie and EDF, which own dozens of coal-fired power plants, received most of the backlash from activists; in Morocco in 2016, it was the mining company Managem. Activists say that the global climate summits provide a golden opportunity for polluters to greenwash their image. "It allows some of the dirtiest corporations in the world to wrap the UNFCCC banner around themselves and pretend to be some sort of climate champion," says Corporate Accountability&apos;s Jesse Bragg. But his concerns go beyond image. "One of the more harmful and less easily identified impacts here is what access that sponsorship can buy," Bragg says. 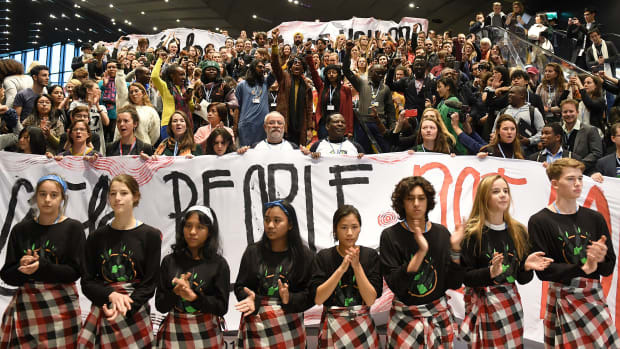 "We know from past COPs that sponsors were able to access VIP rooms; we don&apos;t know exactly what the sponsorship buys corporations at COP24, but we know that they&apos;re not doing it out of the goodness of their hearts." While it&apos;s hard to know just how much access sponsorships can buy, the fact that the sponsorships were kept quiet for so long suggests that corporations might be getting something other than a green veneer for their money, Bragg says. Industry influence could be particularly harmful to the Paris Agreement this year, as governments are working to finalize the rules that will turn its words into action. "All science points to, bare minimum, the need to phase out all use of coal in order to reach the targets set out by the Paris Agreement," Bragg says. "So for this meeting in particular to be bought and paid for by the one industry that practically everybody agrees needs to be phased out for any of this to be realized, is particularly troubling." Practically everybody, but not, it seems, the Polish government. In his opening remarks this week, Poland&apos;s President Andrzej Duda told delegates that "using coal is not in contradiction with climate protection in Poland because we can lower the emissions and ensure economic growth at the same time." 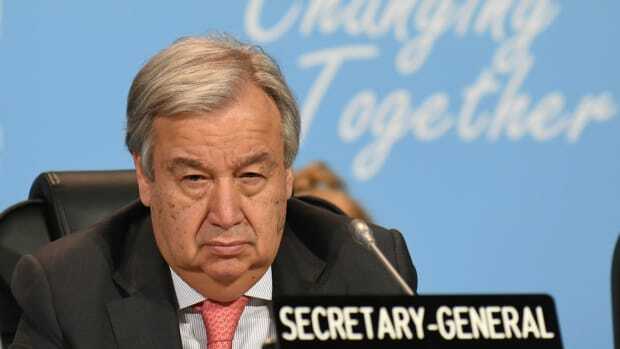 Corporate Accountability has been pushing for the UNFCCC to adapt a conflict-of-interest policy akin to the World Health Organization&apos;s Framework Convention on Tobacco Control policy, which keeps the tobacco industry from influencing the WHO&apos;s work. There&apos;s a lot of support for such a policy among states in the Global South, but activists say that a small but powerful block of developed countries is not interested. "You have a small percentage of developed countries, like the United States, Australia, the European Union that are standing in the way because they&apos;re in the pockets of the fossil fuel industry," Bragg says. 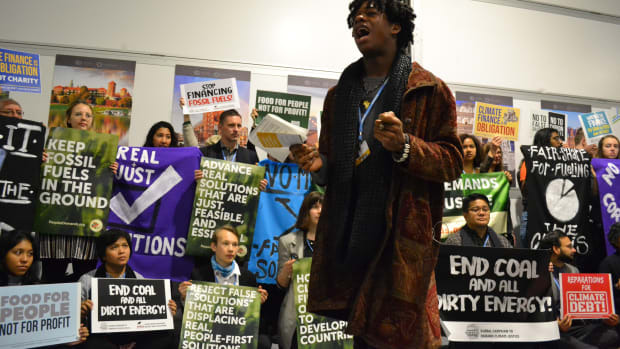 Corporate Accountability&apos;s Sriram Madhusoodanan blames the fossil fuel industry more broadly for pushing negotiators toward stop-gap solutions that merely postpone the globe&apos;s inevitable need to cut carbon emissions. "We know that, while the corporations and their trade associations are in the room, that more false solutions—like REDD+, like carbon markets, like geo-engineering—are going to be pushed through these talks," Madhusoodanan said on Tuesday morning, during an event organized at the entrance to the conference center to demand that countries commit to phasing out fossil fuels. Meanwhile, fossil fuel companies have capitalized on the spotlight of COP24 to announce plans to reduce their own carbon footprint. Royal Dutch Shell, for example, announced this week that, thanks to shareholder pressure, it will set near-term targets to reduce emissions and link executive pay with meeting those targets. Over the past year, ExxonMobil has pledged to cut its methane emissions and contribute funds for a carbon tax campaign in the U.S., but just this week the company announced the discovery of a major oil reserve off the coast of Guyana. Environmentalists see climate action from these corporations as, at worst, smoke and mirrors, and at best, an admirable, but ultimately empty gesture. "Shell is one of the most culpable companies for the climate crisis," says Dipti Bhatnagar, of Friends of the Earth International. Despite pledges to clean up its carbon footprint, the company is still pushing for fracking in South Africa, Bhatnager notes. "So Shell is not part of the solution," she says. "Corporations that operate with such impunity are not part of the future." "It is really important that fossil fuel industries are taking their own personal action on climate change, but I think that the biggest fight here at the UNFCCC is the fact that fossil fuel industries have a seat at the table in the decision-making process in a way that civil society and people on the front lines of climate change do not," says Aneesa Khan, a COP24 delegation co-leader for the youth climate advocacy group SustainUS. "I think that it is a great injustice to see the people that have caused climate change be involved in the process, making decisions for those who are on the front lines of the crisis."